I don’t know about you guys but I am totally dragging this Monday! We had such a fun weekend that I think I am just feeling bummed that’s it over. Or maybe it’s because we were on the constant go go go, and my exhaustion is finally catching up with me. Either way, my eyelids are feeling heavy while I type this. Friday was in the 80s and there wasn’t a cloud in the sky. There was a nice breeze too…it really was an incredibly beautiful day outside. It was the first morning Shane woke up fever free since his stomach bug, so I wanted them to do something fun but still didn’t want him around all our little friends just in case. 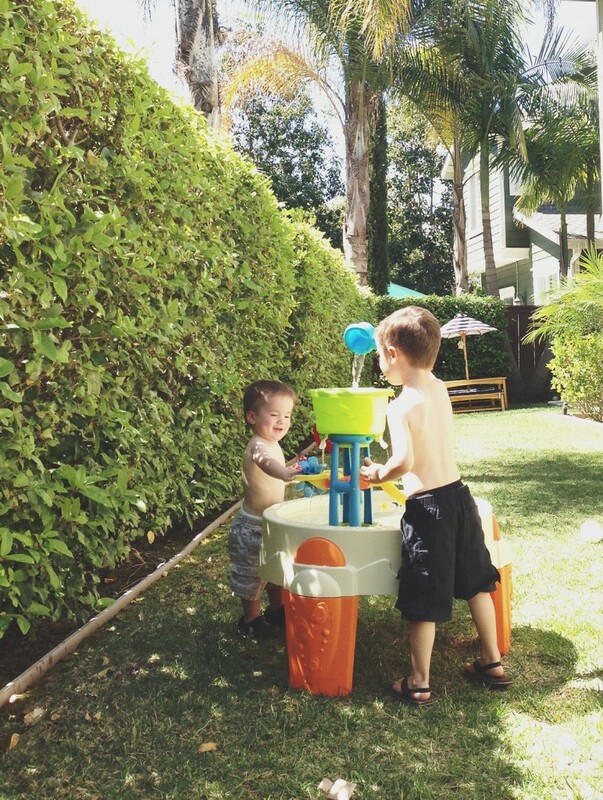 We went to Toys R Us as soon as they opened and picked up a water table and a giant water gun so the boys could splash around in the backyard all day. Once we got home that’s exactly what we did! I lost track of how long we played for, but my face hurt from laughing all day with them. The best part is that they both took long naps after all that play time, and I may have done the same. Greg got home from work and we continued playing outside, but moved it to the front of the house where the warm weather was bringing out all the neighbors. A few drinks ended up turning into a firepit in the driveway kind of night! I love where we live so much…any random night can turn into a gathering of friends, drinks, music in an instant. And our houses are within baby monitor distance so once the kids go to bed the fun doesn’t have to end. Since we all had a late night, the boys slept in (this means anything past 7:00am in our house), and I snuck out to Turbo kick class. When I got home we decided to all go to Nathan’s swim lesson and cheer him on. He is doing so great! I haven’t been in awhile, since it’s his special time with Greg, so I was so impressed to see how much progress he has made. After class we went to the grocery store and stocked up on food since we decided to throw an impromptu BBQ at our house that afternoon. We had 3 couples over and their corresponding kiddos and had a great time firing up the grill for this first time this Spring/Summer! Of course, just like the night before, the front of our house was swarming with neighbors and their kids so we merged our group and had another night gathered around the firepit. After two nights of making some bad food and drink choices I was nervous going into our Sunday morning group run. My stomach was in shambles, I was so tired, and I knew we were going to take on our most challenging run to date. I wasn’t looking forward to it. 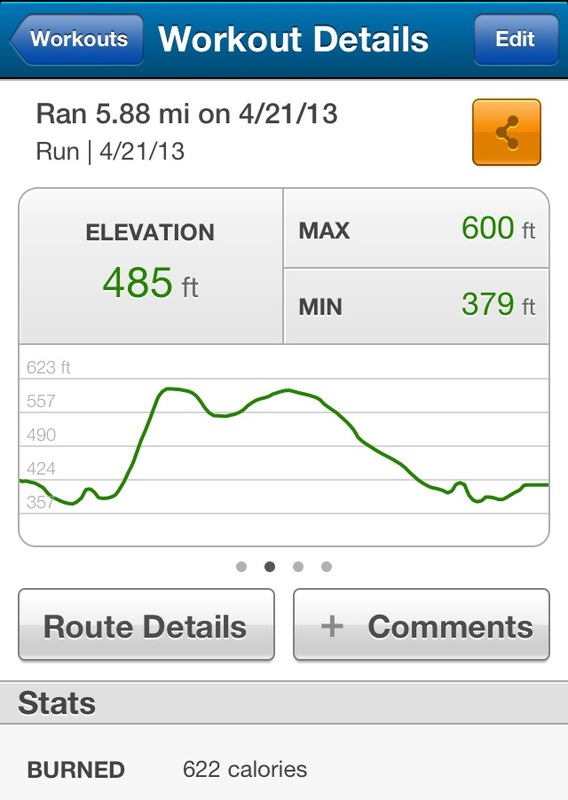 Our mud run team agreed to a 5 mile loop where the 2nd mile was a long and steep uphill climb. Once we got out there a lot of things came into my thoughts…my friend Stasha running a marathon in London at the very moment we were running, my friend Liz busting through her second 10-mile race of the month, and of course the events of the Boston Marathon. I felt INSPIRED and I felt good. Good enough to charge straight up that hill without stopping, good enough to continue the rest of the run at a 9:00 min/mile pace and good enough to run right by the road that leads to our house and continue on, adding an extra mile than I had expected to do that day. I accidentally stopped my Map My Run app early but kept going to what I would think was exactly 6 miles! I think this is why running is so addicting and so gratifying at the same time. You can continue setting small goals for yourself, and sit back and feel proud each time you hit one of them. 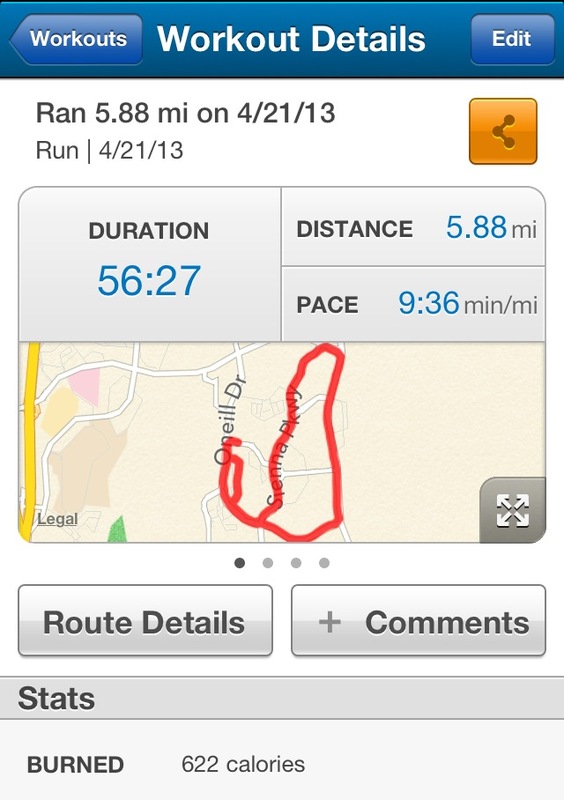 There definitely seem to be setbacks along the way….a bad run….an injury….losing the motivation. But for every setback there is day you get out there and feel awesome, have one of your best days of running, and want to get back out there and reach the next goal you have set for yourself. Honestly, the day I hit double digits in continuous miles ran I think I am going to pass out…from pure exhaustion but mainly from the overwhelming sense of accomplishment. Following our Sunday run, we got ready and walked down the street to a birthday party for one of Nathan’s buddies named Tyson. 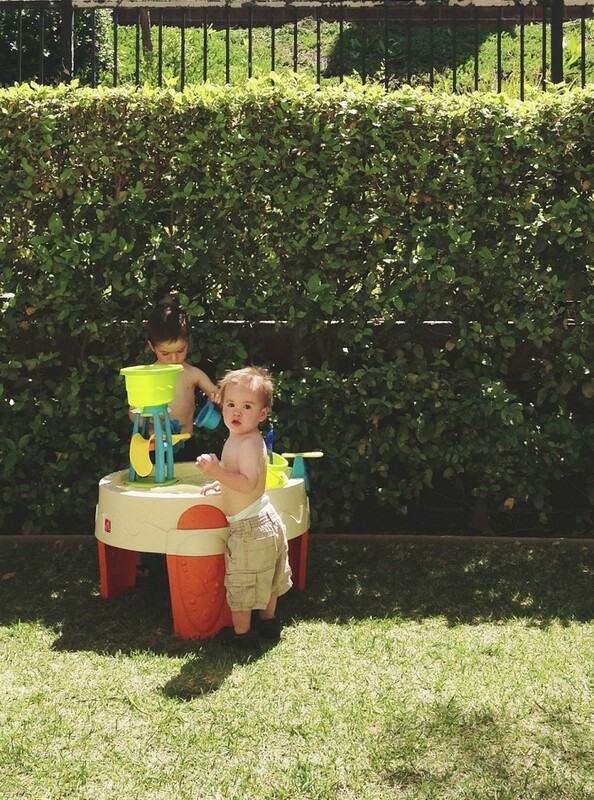 I can’t believe all these kiddos are turning 4 now, it’s totally mind boggling to think about where the time is going. 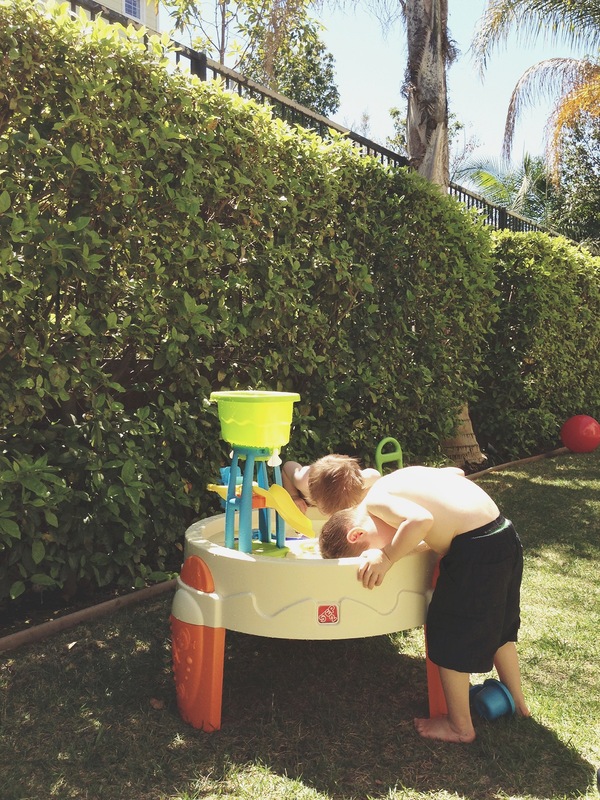 It was a sports themed party which was so fun because it totally ran the boys ragged….we came home and they completely crashed in exhaustion. Since they napped late, and at the same time, we thought we would take advantage of their well-rested moods, so we headed down to Dana Point harbor for dinner. The boys love to look at all the boats and birds, and Greg and I get to enjoy the sunset and the ocean view. While a romantic beach side dinner was once a regular weekend occurrence for us, this picture shows how times have changed since having kids. We wouldn’t change it for anything! 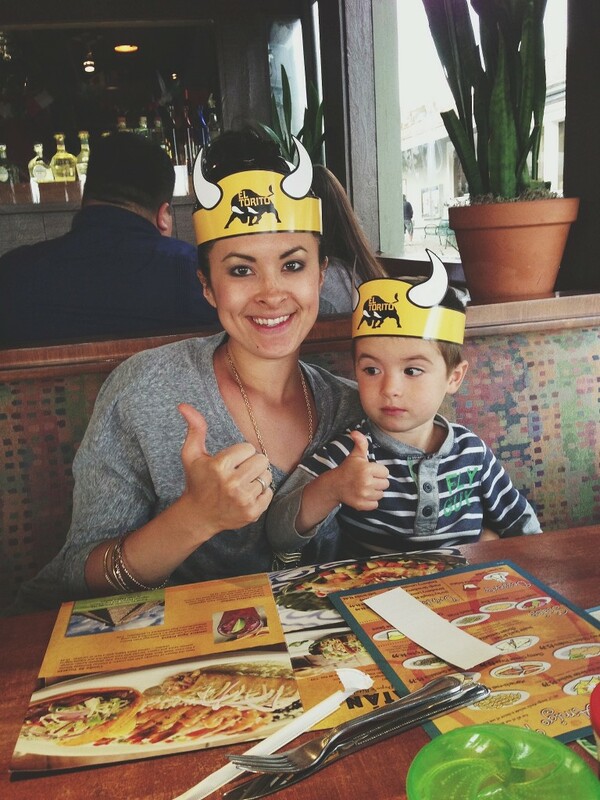 Hope you all had a thumbs up weekend too! 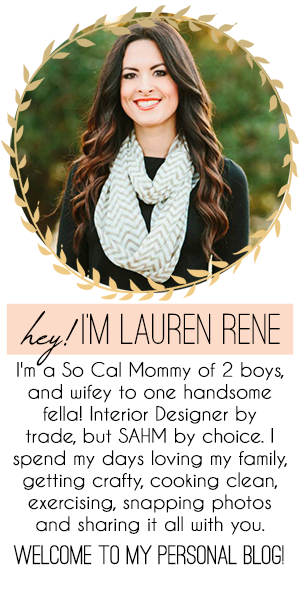 Go, Lauren, Go! Marathon 2015! Baby steps…baby steps!! For now, I’ll watch YOU get there!!! Such a fun weekend! Aren’t neighbors and baby monitors the best?! Glad to hear we aren’t the only ones who do that. Sounds like a great kick-off to the spring/summer!! It really is the best!!! I love the sounds of where you live too! I grew up in such a great neighborhood when I was little and I think it’s so important for our kids too! If we ever have to move back east for some reason we will have to look into your ‘hood lol. Ok… Now I know why we hadn’t heard from you…. Crazy busy fun weekend! Awesome that you are all healthy, thrilled that you and Marissa are leading heathy lifestyles. I will never be a runner, but I love hearing about your accomplishments! Looking forward to next month’s visit! Your neighborhood sounds like so much fun! Glad you had a great weekend.